The first number is the diameter of your wheel. Sizes such as 26, 24, 20, 27.5, 29 and 700c are common tire diameters. The second number (after the X) is the width of your tire. The range for widths is usually between 1 and 3 inches. 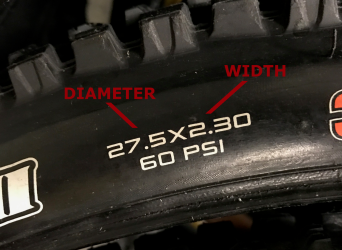 For example, a 26 x 1.75 size means the tire diameter is 26 inches and the tire width is 1.75 inches. While your diameter measurement needs to be exact, your width measurement does not. Because inner tubes stretch, they typically come in a range of widths. For example, one of our most popular tubes is the 26 x 1.75-2.125” which means it fits a 26-inch diameter tire with a width in the range of 1.75 to 2.125 inches. Some tires have dimensions in millimeters, but the basic measurement structure is still the same: Diameter x Width. Instead of inches, you will instead see something like 700c x 18 mm. The letter at the end of the tire diameter is a carryover from an old French system that used letters a, b and c to designate inner wheel rim diameters. After you know your tube size, you need to select your valve stem type. The valve stem is the metal part of the bicycle wheel that sticks out and allows air to go into (and stay in) your tire. There are three types of valve stems: Schrader, Presta and Woods/Dunlop. The Woods (or Dunlop) valve stem is extremely rare and typically only found in the Netherlands or Asia, so we won’t spend any time on it here. Schrader valves, on the other hand, are the most common valve stems found on bicycles. The most recognizable of the bunch, sometimes they are referred to as standard valves. An easy way to remember if you have a Schrader valve is to think of the “S.” Schrader valves are short, sturdy and standard. If you don’t know what valve stem you have, it is likely a Schrader. The last valve stem type is Presta. Presta valves are traditionally found on higher-end bicycles preferred by professional cyclists. Think of the “P” in Presta standing for professional, performance and premium. If you have a Presta valve, you usually know it. Step 3: Durability -- Self-Sealing or Basic Tubes? The last consideration you need to keep in mind when selecting a tube is durability. There is no reason for you to suffer from flat tires - Riding flat free can be a reality. Self-sealing tubes are heavy duty and designed to stop flats for up to two years! To gain that type of protection, you need to purchase tubes that come pre-installed with Slime tire sealant. Alternatively, if you already have empty tubes, but want the protection that self-sealing tubes provide, you can insert the tube sealant yourself. Learn more about tube protecting sealant here. Congratulations, you are now a tube expert! When purchasing tubes, if you consider tire size, valve stem type and durability needs, then you will never select the wrong tube again. Go forth and start riding! I bought a slime tube with a Presta valve ( unbenounced to me) How do I get air into it with a "standard" pump? Everything discussed here except the tube thickness. IS there a number to be found anywhere on a tube to say how thick the tube is?\r\nHeavy duty vs light? Great article. Thank you for sharing your knowledge about inner tubes and additives like slime. This has been very useful. I purchased a tube with a presta valve. how do you inflate with standard pump? is their a adaptor? Most rims these days are not compatible with a 33 mm valve stem, most bikes are being sold with extra deep rims that the current valves can\'t reach through. Any plans to offer anything for the changing style?